As per the IMD, another western disturbance would affect Northwest India from January 24 onwards. Reportedly, the national capital will receive rainfall for the entire week. New Delhi: The national capital witnessed a heavy spell of winter rains on Tuesday. As many as 15 trains are running late due to foggy weather conditions and low visibility. The rains led to the death of two workers. The incident took place on Monday afternoon after the wall of a warehouse collapsed on them apparently due to rain in Delhi’s Najafgarh, the Delhi Fire Service (DFS) said. The deceased were identified as Jasvir and Karim, both residents of Bulandshahr in Uttar Pradesh. A 21-year-old man named Sonu was injured in the incident, police said. The India Meteorological Department (IMD) has, however, predicted cloudy sky with light rain or drizzle. There will be gusty winds throughout the day with the maximum and minimum temperatures likely to be around 20 and 11 degrees Celsius respectively. “Generally cloudy conditions with light to moderate rainfall at most places and isolated thunderstorm activity accompanied with strong surface winds most likely during January 21 and 22,” the weather department said. 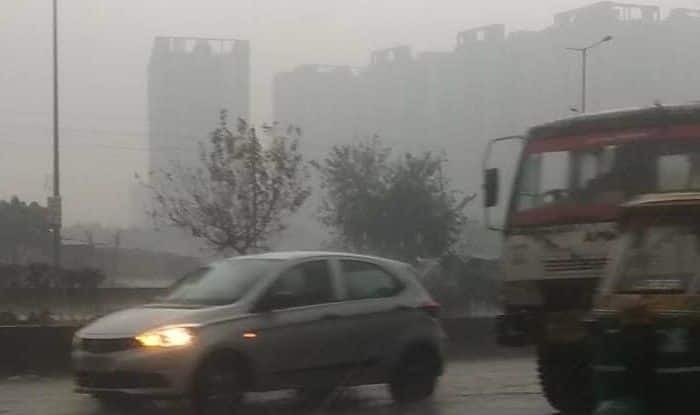 Delhi and the national capital region has been witnessing a sudden spell of rains accompanied by thundershowers since Monday afternoon. The showers continued leading to a drop in temperature. Water-logging and long traffic jams were reported from many areas in Delhi due to heavy downpour. Heavy rainfall brought an improvement in the air quality of the national capital. The minimum temperature was recorded at 11.5 degrees Celsius, four notches above the season’s average while the maximum temperature was 22.6 degrees Celsius, a notch above the season’s average. The MeT Centre at Lucknow has also predicted rain and thundershowers with gusty winds for today in the next three hours, that is, until 12:15 PM at some places over Hardoi, Bahraich, Lakhimpur Kheri, Sitapur, Meerut, Hapur, Shamli, Baghpat, Muzaffarnagar, Gautam Buddh Nagar, Ghaziabad and adjoining areas.